Nicholas Wood, Political Tours’ Director was recently interviewed by IdeaMensch, a website that spots new entrepreneurs. It’s a great insight into how the company was set up and what motivates us. 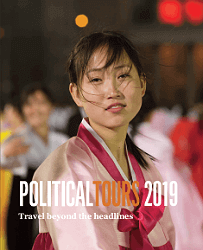 Former New York Times correspondent, Nick Wood, set up the world’s first tour company dedicated to current affairs after a decade of working as a reporter in the Balkans. Political Tours was inspired by his work as a foreign correspondent and his desire to give people an opportunity to explore the news at first-hand. The UK based company looks at pivotal regions in international affairs such as North Korea, the Middle East, the Caucasus and the Balkans. Soon it will explore issues closer to their base near Oxford. These include Scotland’s drive for independence and the UK’s economic crisis. Political Tours gives people the opportunity to meet the communities affected and put questions to politicians and top analysts. It’s a counter-point to a world where twitter and blogs reign, and serious newspapers are under pressure. The company is also part of a new trend in travel that puts greater emphasis on life-changing or challenging experiences. 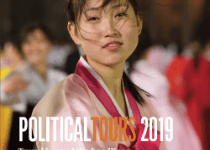 Political Tours also works with businesses that want to understand key political and economic trends in a new market, but want do it in a way that gives them a real feel for the country. Apart from his work with the NYT, Nick has worked with the BBC, Washington Post, Guardian and Observer. High (and low) points of his reporting career include tracking down war crime suspects and losing an armored Landrover to a tank. We are setting up a tour in Bosnia with Kate Adie, probably Britain’s most famous foreign correspondent from the last 30 years. She will be re-visiting some of the places she reported from. Bosnian journalists and international officials will be updating us on the latest in the country, which is in an ongoing political crisis, with Bosnia’s Serbs still pushing to create their own state. That’s a tough one. It can be very varied. We spend a lot of time talking with teams in each country, setting up the tours. I’m often on the phone with clients or meeting them (usually in London). We also like to keep up-to-date with international affairs and attend foreign-policy forums. When not in the UK we are out in the field setting up our tours. – Niche tourism – people are fed up with ordinary holidays. – Café and club scene in Kosovo – Pristina has to be the ugliest city in Europe but its clubs and music venues are as good as anywhere in Europe and more edgy. – The economic crisis as an engine for change: the current climate really makes people think how their money can go further and how businesses can become more efficient. I’m very visual. We essentially look at political ideas or developments and try and turn them into an experience you can see and feel. At the same time we don’t want to be voyeuristic. We combine these experiences with analysis from experts and meetings with local people. First-rate serious reporting – fewer places do it, and news is increasingly opinion driven. I hope what we do is substantive, stimulating and a counterweight to the blogosphere. Trusting the ethnic Albanian guerilla who told us where to put our armored vehicle during a lull in fighting during this six month conflict, (Macedonia 2001). One minute later (after stepping out of it) it was in flames, and we were hiding in a ditch. A ton of lessons came out of this one including many about my unsupportive employers at the time, (Where’s our kit? Not we’re glad you’re alive). But on a more general scale; if you trust someone to do something make sure they know what they are doing (and assume responsibility for it if it goes wrong)! Set up an outward bounds company in Kosovo or Macedonia. Both are stunning countries with incredible scenery, and people are incredibly hospitable. Great for hiking, climbing, biking and undiscovered – huge local market to tap into as well. A lot of news. The New York Times, Financial Times for great reporting. Sites like Global Dispatches and Current Intelligence for angles and news that don’t get mainstream coverage. Balkan Insight, and Courrier Des Balkans (French) for Balkans coverage and Tim Judah’s twice weekly Eastern Approaches column in the Economist is a must. Non-business: Gita Serreny’s biography of Albert Speer – an incredible assessment of moral responsibility. On business: Alex Blyth’s “Brilliant Online Marketing.” A great product is nothing if you don’t know how to market it. This was a good start. Been around for a while but Skype is easily our best used app; phone, video and screen sharing. We work with teams all over the world and love not paying a penny to big phone companies for the privilege. @CarlBildt – Sweden’s foreign minister and an honest tweeter. European politics as it happens. @CJChivers – fellow correspondent from the NYT – techie, ex-US marine and gun obsessed, but one of the best war correspondents of our era. See his recent article about Libya’s use of cluster munitions and the spurious counter claims that materialized on the web, a great example of good reporting trumping opinion-driven blogs. 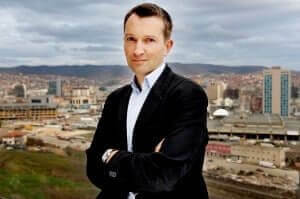 Elizabeth Gowing @ElizabethGowing – Founder of the IdeasPartnership in Kosovo. Tireless and selfless, she has inspired thousands of people in the western Balkans to take an interest in their environment – protect local architecture, fight pollution, and help educate the Roma, the downtrodden underclass of the region. My daughter told me a school-yard joke that I hadn’t heard for thirty years. What would you recommend to any new start up? Sounds dull but shared offices are a brilliant idea. Low costs and the contact with other companies really pay off. Our company has an office in a building that houses web-designers, PR companies, printers and book keepers – the bricks and mortar of most businesses. The crossover of ideas is also a fantastic boost. Like many entrepreneurs I am still wrestling with that answer. But I know one thing; we have young kids, and if they’re not happy the business is bound to suffer.